All Hail the Mighty Pīrāgs! For the past eight or nine years, making pīrāgs, those baked Latvian bacon buns, has been a Christmas tradition in our household. More precisely, it has been my tradition, my contribution to Christmas. It doesn’t always go smoothly. I only make them once a year so every time I roll up my sleeves, I need to jog my somewhat limited culinary skills. Sometimes I don’t nail the dough and it takes a lot of coaxing and off-colour muttering to get it to rise properly. I’m told I get sloppy with the egg wash. Other times my pīrāgs will open up in the oven. I then call them peek-a-boo pīrāgs. I think I may be onto something because I’ve seen photos from Vincents in Riga run by expat chef extraordinaire Mārtiņš Rītiņš with his pīrāgs showing their bacon. And if I get a late start and it’s past midnight as I hit my 100th pīrāgs, you might hear me muttering a bah humbug or two. But the job gets done and there are no complaints. The pīrāgs usually disappear over the next few days as members of the household graze. I’m told I should bake them more often. Judging by photos posted by my Facebook friends, making pīrāgs is a ritual that is repeated around the globe by those with Latvian roots. This even in the Toronto area where the Latvian Centre bakes and sells them on a regular basis. I’m told they fly off the shelves even at $1.25 per pīrāgs. Pīrāgs is Latvian comfort food. You can have them with coffee at breakfast, soup at lunch, as a side at supper and snack on them in between. If push came to shove, you could survive on them comfortably for days. In my travels researching the history of Latvians in Canada’s Manitoba province, I have been told and seen pictures of pīrāgs still being made in Lac Du Bonnet homes where Latvian pioneers and fleeing 1905 revolutionaries settled more than a hundred years ago. I have been served pīrāgs by a wonderful lady, an octogenarian, who lives six hours from Winnipeg in rural Manitoba. She was born to a Latvian pioneer family that came to what was then wilderness from Latvia via Brazil. Pīrāgs is the ultimate survivor. It has transcended time and geography. The tasty morsel has become an embodiment of Latvian heritage. Putting aside the large recent outflow of Latvians heading west for better economic opportunities, the Latvian Diaspora was formed and run for many years by those fleeing the Soviet occupation of Latvia. Even though community leadership has been taken over by their baby boomer offspring, or at least those still engaged because the majority have drifted to the periphery and beyond, old attitudes still prevail. Many would dismiss the pīrāgs as being void of cultural substance. Akin to Oktoberfest, oom-pah and lederhosen German. But the fact is that pīrāgs are still being made and chomped down by second, third and fourth generation Canadians, Americans, Australians and Brits with few other connections to their Latvian heritage apart from memories and family stories passed down from their parents, grandparents and great-grandparents. The Post World War II Latvian Diaspora is still focused on the exception. As an example, the focus is on the one in ten children and youths of Latvian descent who attend Latvian Sunday schools or Garezers summer high school in Michigan. The one in ten Garezers graduates who make their way back to Latvia. No doubt about it, Garezers is a wonderful place where Latvian language, history and culture are taught. It must be sustained and participation encouraged. But what about the one in ten who don’t make it to Garezers? Or the ninety-nine out of a hundred who don’t make it back to Latvia? What about those for whom that ultimate Latvian survivor, the pīrāgs, is one of their few Latvian connections? There are around two million Latvian speakers in the world and less than one and a half million Latvians in Latvia. That’s not a lot. It’s smaller than many cities in Europe and North America. A nation with numbers that small cannot be picky. It must reach out to those of Latvian descent in the pale and beyond be they 100%, 75%, 50%, 25% or even 12.5% Latvian by blood. It must venture into pīrāgs territory. The Latvian Diaspora must do so by being multi-tier, inclusive and modular. Latvian language skills, be they a limited vocabulary or complete fluency, must be encouraged. At the same time the reality of a second language be it English, Spanish, German, Swedish or Russian needs to be recognized. There need to be ways to engage those with poor or even no Latvian language skills. The Diaspora needs to be welcoming to all who have or are seeking a Latvian connection, be they newbies from Latvia, descendants of Latvian immigrants or those who have drifted away from the community and are circling back. It also needs to welcome any non-Latvian partners who wish to engage. The Latvian experience abroad can only be modular. It cannot be 24×7. It must be served a la carte. The Diaspora consists of multiple constituencies, each with different interests and possible points of connection. Traditionally the Diaspora has served its members a heavy dose of Latvian culture and politics. That does not work for many. New points of engagement are required – a segue for possible deeper levels of engagement for those who so wish. Sports has been grossly underrated by the Diaspora establishment. But when BMXer Māris Štrombergs wins gold at the Olympics or takes the USA Open Nationals, when Šmediņš and Pļaviņš upset the USA in Olympic beach volleyball, when goaltender Kristers Gudļevskis almost singlehandedly upsets hockey super-power Canada at Sochi, when thousands of Latvians vote every day to put up and coming hockey player Zemgus Girgensons into the NHL All-Star game, when Latvians medal in the bobsleigh and the Dukurs brothers dominate in the skeleton, even those with tenuous connections take note. These modern day heroes should be featured front and centre in Latvian media abroad rather than the serpentine comings and goings of Latvian politics. While it is regrettable that so many young people are abandoning Latvia, they will continue to leave until conditions back home improve. Frowns from Latvians who have lived abroad for decades and have no intention of returning will not change that. Latvian organizations need to reach out to the immigrants and provide information that they need, about schools, housing, social assistance, health insurance and by the way, here’s what’s happening in the community. This isn’t happening. As people get older, they take interest in their lineage, who they are and where they came from. More than a few are digging into their family trees, signing up to genealogy web sites, hunting down lost relatives. But when they hit Latvia, they often come to a dead-end. Although many records are now online, try deciphering cursive Russian and Gothic German script once you start digging past the 1920s and the early days of independent Latvia. Even modern Latvian is a challenge for some. It is a hit and miss proposition finding help. Latvia is being discovered. Pick up glossy coffee table books with destinations compiled by National Geographic or Lonely Planet. Latvia is there – Old Riga dating back centuries, a treasure trove of Art Deco buildings in Riga, miles of white sandy beaches along the Gulf of Riga, hundreds of manors, some in ruin and others restored to their former splendor, or the relatively unspoiled countryside. There are opportunities to promote travel to Latvia for Latvians and non-Latvians alike. Latvia is on the bucket list for some. A once in a lifetime trip. There are those who wish to retrace the journey that their parents or grandparents took as they left Latvia and ending up in Displaced Person camps in Germany. Others want to visit the homeland of their forbearers, perhaps finding the remote rural homestead or the manor where their ancestors toiled. Not easy if you can connect only some of the dots. Where do you go for help? More English and bilingual web sites are needed. There are a profusion of sites in Latvian but interesting sites serving up or aggregating content for those not fluent in Latvian are few and far between. There are many opportunities. One needs to think out of the box. The focus must be on the consumer, what they want and not what we think they need. The question for the Latvian community abroad is not just about right-sizing in face of dwindling demographics in order to continue serving the core. It is a question of survival and reaching out to the periphery and beyond to any with Latvians roots or interest in things Latvian. To reach out to the realm inhabited by the mighty pīrāgs. These are questions that transcend time and space. There is little to distinguish a baby-boomer off-spring who has drifted away from the community and who struggles with all but the simplest conversations in Latvian, from someone whose grandparents came over more than a hundred years ago for whom only a few stories and Latvian traditions have survived, from children of recent immigrants, many of whom in the next ten or twenty years will succumb to assimilation much like their predecessors. Time and space may differ but their stories are or will be the same. But throughout it all, the mighty pīrāgs is there. It will be baked and savoured reminding all of their Latvian connections. Let’s make sure that it’s not the only thing standing. Viesturs Zariņš lives in Canada and is a periodic contributor to Latvians Online. He was a member of the World Federation of Free Latvians executive board from 1991 through 1999 and a board member of the Latvian National Federation in Canada for 10 years, including three years as its president. He is a former principal of the Toronto Latvian heritage language school Valodiņa. For the past nine years he has represented the Latvian Hockey Federation and handled player recalls from Canada to World Championships. Very interesting article. I visited Latvia in 2011. It is wonderful beyond imagination. My husband, Modris, was born in Latvia and came to this country at age 10 through the D P camps in Germany after WWII. His mother would not show me how to make pirags so he put me in the car and took me to Chicago where his aunt taught me. I still make them. What a wonderful thing to do. We also put apples cinnamon and sugar together with the dough – delicious. Sveiki; How nice that you were so motivated. I also came to the USA at age ten and I understand the love of pirags. I’ve not had pirags since my mom passed away in 2002. The only recipe i have is in Latvian and i can’t understand it (unless much alcohol is consumed)). Would you be so kind as to post your recipe in English so I may enjoy the pleasure of reliving my childhood,, and then introduce the Latvian Pirags to my friends and neighbors? Thank you for your thoughtful article. If u e mail.me the Latvian recipe I can translate it to English for you. What a delightful article! I’m one of those whose piragi sometimes come out with a bit of bacon smiling out of the dough. In no way does that little mishap deter from that indescribable aroma as each platter comes out of the oven – there are tens upon tens of recipes how to create this Latvian treasure – each with a special touch of “how mamma made it” “how older sister Dzintra” creates her dozens and dozens of extra yummy piragi. One thing is a sure thing – we haul out the Kitchen Aid breadmixer (for those of us whose hands are not up to kneading any longer) and put the Pappa of the house to cut the bacon, while Mamma sautes the onions, etc. and we know for sure Christmas is on its way. Piragi shouldn’t be the only ties we have with our “dzimtene”, but it’s a good start. From a warm and fuzzy beginning about my favourite Latvian treat comes a thoughtful and important article about how all Latvian-connected people should be embraced by the diaspora and celebrate all things Latvian wherever they may be. Thank you! You’ve inspired me. Right on for the need to communicate bilingually for all generations, recipes included. The ALA Latvian Museum regularly gets genealogy requests from descendants of 1905 emigres and yes, Latvia needs to be more globally helpful to its far flung “children” abroad. My parents, brother and sister were in a DP camp in Germany. They waited three years for a sponsor. My sister was born in what used to be a castle according to my mother. My sister does not have a birth certificate. How can we go about getting information about the whole ordeal? Great article! Interesting and well-written, shall be shared with my half-Latvian offspring. One small correction, though: the predominant architectural style that Riga is so well-known for is Art Nouveau, not Art Déco. that specifically describe the shape of a pīrāgs (it has distinct ends), someone had no imagination and, worse, decided to flout centuries of tradition. Yes, you can still buy the traditional pīrāgs, but there are so many other pastries by the same name, it is now just “a” pīrāgs, not “the” pīrāgs. I’m a terrible baker. I’m very thank full that I have 4 nieces that have learned to make pirags from their Oma. So very Christmas I savour their delicious baking. They are all so good at keeping some of the Lativan traditions. my parents came to America in Jan of 1950. i was born here, and am truly Americanized. But, i am Latvian at heart. My friend Anna, and i, we get together 2x a year to make Piragi. we really get into it, talk, drink wine, and make 3 batches of piragi. it is alot of work, but we love it! we make some for Jani, midsommer, and Christmas time. we have been doing this for many, many years, and will continue to do so. Yes, indeed, as we all know so well “Piragam nabagam, abi gali abdegusi”. Nothing more to add but “Awesome article”, well done. Thanks a million! what a remarkable concept–that the humble pīrāgs–a blending of yeasty dough and streaky smoked bacon could have such a global impact–in one tasty morsel transcending distance and time, bringing us all back to our Latvian roots in an instant! 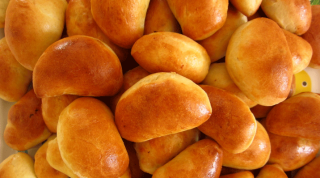 Re Latvian food – and yes, I adore pīrāgs , I live in Brisbane where once we could buy proper Latvian Riga bread with caraway at the supermarket. That bakery was taken over by a large organization and no longer produce that kind of food. I’ve a special meatloaf recipe in which the loaf is cooked to the same shape of the loaf; it’s basted during baking with a sauce which becomes sticky and black, and refrigerated overnight yields a wonderful supply of slices to be sandwiched between slices of Riga bread. I’ve tried to source the bread, without success. If anyone knows of anywhere in Australia, especially Queensland, where it can be bought, please let me know.